Garuda Mall, Bangalore is back with Voice of Bangalore event. This time it would be season 4 of Voice of Bangalore. This show has received an amazing response in the last three years. Like other TV shows "Indian Idol", "TVS Sa Re Ga Ma", this event also provides an oppertunity to talented singers. You can get more details here. I had attended the first Voice of Bangalore in year 2007 and let me share its highlights for you all readers of Express YourSelf ! It may inspire you to attend this event live at Garuda Mall, if you are in Bangalore. Gili Voice of Bangalore Season 1 Mega Final. Auditioned by eminent personalities from music industry like, Chandrika Gururaj, Praveen Godkhindi, Pallavi, Sangeetha Katti, Ganesh Desai, Supriya Acharya, Sunitha S, Fayaz Khan, Jimmy Raj, Satyaprakash, Biju Nair and others. The auditions at the Garuda Mall, ITPL, WIPRO (Electronic City campus), National College and M S Ramaiah Institute of Technology. Judging panel : Bollywood singer Kumar Sanu, music director Guru Kiran, Kannada director Indrajit Lankesh and film producer Ashwini Ramprasad. Now look at the show, performance, comments from judges and winner announcement. Jane Ja....Dhundata Fir Raha...Main Tumhe Raat Din..
Aaj Kal Tere Mere Pyar Ke Charche Har Jabaan Par. And the winners for first season Gili Voice of Bangalore were software engineer Shakti Prasad (male), and data analyst Supriya Ramakrishnaiah (female). At last Kumar Shanu has message for all the participants, who could not win : "Ruk jana nahi tu kahi harke...". Kumar Sanu and Guru Kiran also performed at the show. 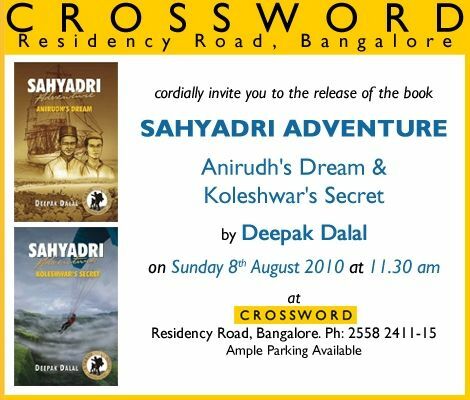 Last month, 8th August Sunday, I attended a book release function at CrossWord, Banglore. “Sahyadri Adventure” by Deepak Dalal. So far, I have attended few such book release events. I wrote about them at my blog also. Poems+Paintings A view from the outside However, I felt, this event was little different from earlier books release at Crossword. It was more like, ... an informal gathering. No additional guests at stage. Mr. Dalal frequently mentioned about, his friend. He was also sitting in the audience only. When Nadan Nilekani or former Finance Minister Mr. P. Chidambaram released their books, all major media channels were present. No media that day. One thing I noticed and appreciated about the author. He was just speaking with his heart, being in the present moment. He did not care, weather his speech would influence people to buy the book or not. He just talked. He talked about his efforts to write this book. He spent hours in the libraries of universities and referred old books. They were dusty and causing sneezing. He himself traveled a lot. Manytimes, he traveled by walk, to mingle with local people, understand them and capture them into these books. He shared all this experience. His face was glowing with joy of putting his 100% efforts to write this book, to create story. The result is such wonderful books. A fantasy story is nicely woven with historical facts of a specific location. Deepak Dalal has been writing adventure books for children for over a decade now. He has also conducted various workshops at schools across the country, where he showcases his numerous journeys. These books addresses the teenagers. The teenagers are used to read Harry Porter stories. They read some popular stories with foreign character and foreign background. Somehow, Such adventures stories are missing in our culture. Deepak is filling this gap. He wrote story with Indian characters and Indian background. He researched about Indian history. He developed Indian characters in his book, who lived in that history. The young generation can identify those characters with themselves. They can learn history. They can appreciate that, every place has history. There is a past, behind the present. That past has contributed for the present shape of any place. I recommend such books for school library, for extra - curricular readings. His books talked about various geographical locations. Lakshadweep, Ladakh, the Andaman Islands and Ranthambore etc. One book is about Ladakh. We saw Ladakh in some patriotic movies. He visited those places. Lakshadweep and Andaman Islands are just few dots, in the ocean, at our Indian map. No !!! They are beautiful places to visit. They have history. He also talked about his book "The Snow Leopard Adventure". The snow leopard is a typical animal. Its color matches with background color of Himalayas. Deepak waited for three days to watch the snow leopard. One more book is about jungle. He is concerned about decreasing strength of tigers. Now, it is illegal to decorate drawing rooms with tiger skin. Still hunters kill tigers to get theirs bones!! Deepak explained the reason. Tiger bones has some health value in Chinese health therapy. The Chinese people has killed all its tiger. Now China is importing tiger bones from India. The greed of people and failure of enforcement of law by government are major concerns. "Sahyadri Adventure" book is about Mumbai / Bomaby of 1850. When I think about Mumbai, the first things come in my mind is: running people to catch local trains. The 'selfish' people, I think 'focused' is batter word compare to 'selfish'. Focused for money. They are money oriented. Mumbai is business capital of India. Today, Mumbai means a place with stock market, Chopatty, Local trains, Bollywood, Bal Thakare… This same Mumbai was completely different in the history. It was just a group of Irelands, that no one wants to keep with them. Someone gave other party as dowry. Finally it came to East India Company. They realize its potential due to port. He saw some sketch of jetty. Those days, no vehicles. People used to carry the imported cartoon in hand lorry. Even people used to travel abroad only in steamer. So they traveled in small boat to and from big steamer to jetty. And then they have PALAKHI. He wants to rekindle the curiosity particularly in children and youngsters about history. He told, "As a kid, I would travel to Fort (Mumbai) to visit my father's office. I realised there was no fort there, yet the name survived. ...."
We just wondered when he showed us some sketch of Church Gate, Narimon Point etc. It was unbelievable yet, we do not have a choice!! We convinced ourselves: those days, population was less, infrastructure was not developed fully. So yes, Mumbai should be as like this sketch. Have a look to these pictures, where he is sharing those sketches with power point presentation. Also see this video. Click Here. He thanked a kid, who drew all these sketches for his book. The author, wrote a story around this place and time for teenagers, to teach them our Indian history. Let the teenager realize that history is not such a boring subject. It is not about remembering events and its year. It is much more than that. Someone from the audience commented that these books teach geography too. It reminds me a mail with similar sketch about old Bangalore. Once upon a time, "Nimma Bengaluru" (our Bangalore) was different. Our Kannada teacher explained, how the different areas get different names. Once RJ Vashanti also initiated similar discussion on her radio show on Radio City. She asked people to share name of Bangalore area and history behind it. Bangalore has rich history. King Kempa Gowda, poet Kuvempu etc. So yes, we should have such stories to address teenagers. It should be with our local history. Gujarat has rich history of Girnar, folk stories, Somanath. Even my native place Mithapur has history. Mr. R.M.Lala captured it in his book "Creation of Wealth". The young generation will remain unaware from local history, if we force them just to score high in exam, to remain competitive. This book was thought provoking to me. We are just presence here on this planet earth for a duration of time. Here everything is changing. Even once upon a time, we had ocean at the place, where today we have Himalayas. This event also reminds me, my visit to a small museum at famous Vishala hotel of Ahmedabad. I thought, our next generations will laugh at us, as we are using some old technology 2G, 3G, 4G (LTE) mobiles. Our latest Android based phones will be in such museum. I also realized that yes, we should learn local language, local culture to mix with people, perticularly if one is intended for social service or politics. HDH Pramukh Swami Maharaj many times, address the local people with specific way. E.g. Bhvanagar people are with feelings (BHAV), Jamangar is CHHOTE KASHI (small Kashi. Kashi is a pilgrim place for Hindu). Even he made comment about me and my native place, during our personal interaction. Guruji Sri Sri Ravishanakr talks few words, sentences in local language, wherever he goes. He knows many languages. In short, a place has not only geography. It has history. It has culture. It has literature. It has folk songs and fold stories. A shared belief of people about Dos and Don’ts. A language. A local leader. A local sports. A local celebrity. A local source of inspiration. Probably we cyber citizens have forgotten this fact. We worships Google like a God, but we are unaware about local mythological stories. So let’s be aware about it. I will write sometime about my Kannada learning efforts at our own blog. “Express YourSelf !” Yes, once a upon a time, in my college days I too researched about history and geography of Nadiad city. Sometime, I will share it with readers of this blog. At the end, we had interactive question-answer sessions with the author. We had concern that such books are only for rich teenagers. Poor kids do not get exposure to such books, who are studying in the Government school, Kannada medium school. One enthusiastic person had some plan, project for social service, he asked for Deepak’s time for discussion. I wish all the best to Mr. Deepak Dalal for his book.